“I almost died!” Hudson squeals with a dramatic flair that only pre-teen girls are capable of. She flops herself across the grey ottoman in the sunshine-filled living room, her dark brown ponytail makes an arch as it whizzes through the air before she lands with a soft thud. She’s doing a theatrical retelling of the afternoon run she embarked on with her mother the previous day through their neighbourhood. The belly flop into the cushions mirrors her throwing herself on the neighbor’s lawn when she got tired towards the end. “I told her she could sprint for the last block,” Summer says matter-of-factly from the kitchen, adding that Hudson is good at sprinting, it’s the longer distances that she doesn’t do as much. “Mom! I almost died!” Hudson insists. The smell of bacon is wafting through the air, the satisfying crack of an egg on the side of a pan, the sound of the toaster being pushed down. A cat glides across the window sill and Hudson props herself upright and sits properly in the grey chair. The pair, mother and daughter, do just about everything together: working out, socializing, learning and day-to-day routines. From the outside, it seems their lives have come to orbit one another succinctly. Summer Bertrand was a high school phys ed. teacher for 15 years before recently taking on the position of re-engagement student success instructional coach Indigenous education with the Hastings & Prince Edward District School Board. Hudson Mulvihill is a vivacious Grade 6 student at St. Michael’s Catholic School in Belleville, an athlete and a young advocate for Indigenous issues. About three years ago, the family uncovered paperwork that confirmed their suspicion that Summer’s father is from Tyendinaga Mohawk Territory, prompting both Summer and Hudson to become more interested in learning about their cultural background together. Hudson sits on the floor, places her plate of bacon and eggs on the coffee table, takes a wad of blue gum out of the corner of her mouth, adhering it to the side of the plate and picks up a piece of toast. 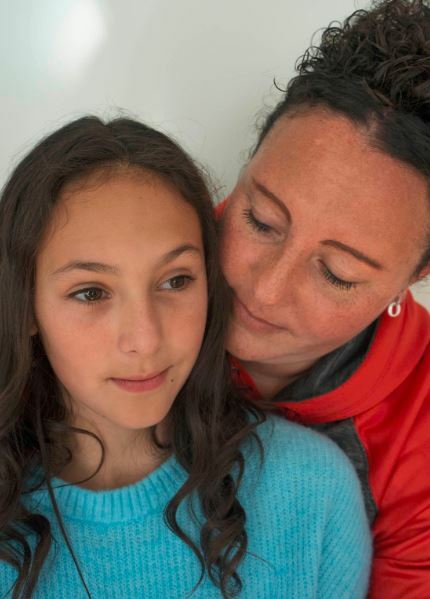 “I said, ‘Mom, I want to try lacrosse,’ and she was like, ‘What…? You do realize that if you play lacrosse you’re going to get hurt a lot,’ and I said, ‘Whatever, I don’t really care, I’m going to try a new sport,’” Hudson retells. She became interested in the sport when they were at a friend’s house and she saw his son throwing a ball at a re-bounder in the backyard, catching it in the net of his lacrosse stick each time before throwing it again. “I just thought it sounded cool and then my mom said, ‘You do realize that it’s on the reserve and it’s their sport,’ and I said, ‘Yeah, I know and I’m Indigenous.’ But people who are non-Indigenous, they can still play. But some people just try to beat up the girls because they don’t like the girls playing lacrosse,” says Hudson. At her first practices and games, Hudson remembers being a bit scared because she wasn’t sure how to hold her lacrosse stick properly. She recalls her coach yelling from the bench in Mohawk and nodding along, pretending to understand what he was saying, reading his body language for clues. Summer stays in the kitchen, cleaning up and allowing Hudson to tell the story in her own way. Hudson is an only child and her view of the world is vastly shaped by the way that her mother thinks. Summer doesn’t want to sway her daughter’s opinions one way or another, allowing her to form her own identity but realizing that as her daughter grows, she mirrors her mother in many ways. She isn’t sure of the dates or numbers but she remembers wondering to herself what it meant to be Indigenous. She knew it meant that she is a part of the original people of this land, but what else? Lacrosse has been an important point of connection to the community for both Hudson and Summer. 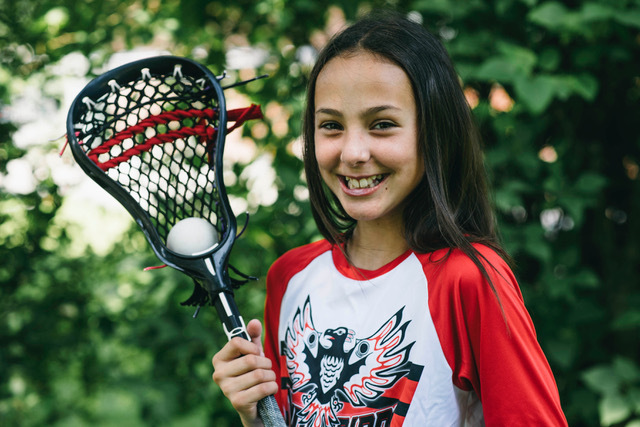 “When I went a year ago to the pow-wow, everyone was walking around with lacrosse sticks and I had no idea what it was… a year later when I went to the pow-wow I knew all those people,” says Hudson. Summer ensures that Hudson stays connected to the friends that she meets in Tyendinaga and that she’s able to build connections there by taking her to the pow-wow, fair, dances and friends’ houses. “I look forward to going down there, especially to the outdoor lacrosse box. You get to socialize with everyone and learn and understand sort of where you’re from. There’s outside dynamics that you never knew because you didn’t grow up there but it’s interesting to be a part of it. And I think my dad feels a sense of pride in that too,” says Summer. Hudson finishes her breakfast and wipes down the coffee table where her plate was. Through the large window that encompasses the front of their house, you can see a car pull up to the curb. “Huds, your dad is here,” Summer motions to the door and grabs a jacket to wrap around her shoulders as Hudson runs out the door with a basketball in hand. “Call me and let me know what time you’re going to be home!” she yells down the driveway.